This was the perfect dinner for tonight! Ya see, we’re having some unusual weather here in Alabama. IT SNOWED TODAY!! Depending on where you live, you may not think that’s a big deal. But trust me, it’s a very rare and beautiful occurrence here in the Deep South! Usually all we get is sleet and freezing rain. Basically it’s sheer misery…not the soft, powdery, movie-style snow. In fact, for much of today, the snow was mixed with freezing rain (which only causes the snow to melt and turn into muddy slush). However, this afternoon, it was a full-blown snow storm for a few hours. So, naturally, my husband and I did what any born-and-raised Southern folks would do…we went out and played in it!! For 15 minutes…and then we were cold. Anyways, on a freezing, snowy, wet day like today, this dish was the perfect dinner. It’s hot, hearty, and delicious and takes less than 30 minutes to cook. I found this recipe after searching for a way to use up some leftover Velveeta cheese after I made Chicken Spaghetti last week. 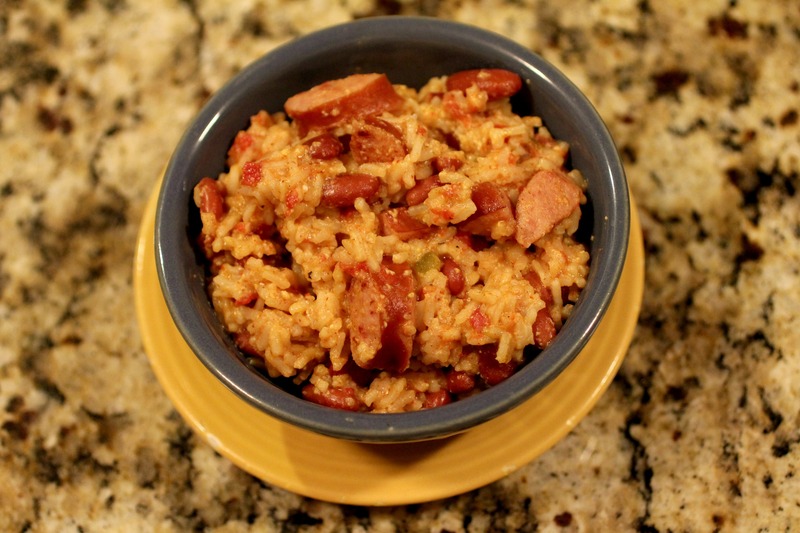 I’ve had red beans and rice plenty of times, so I was interested to see how this new recipe would taste. It was awesome! The Velveeta isn’t overwhelming, but it just gives a hint of cheesiness and makes the dish creamier. 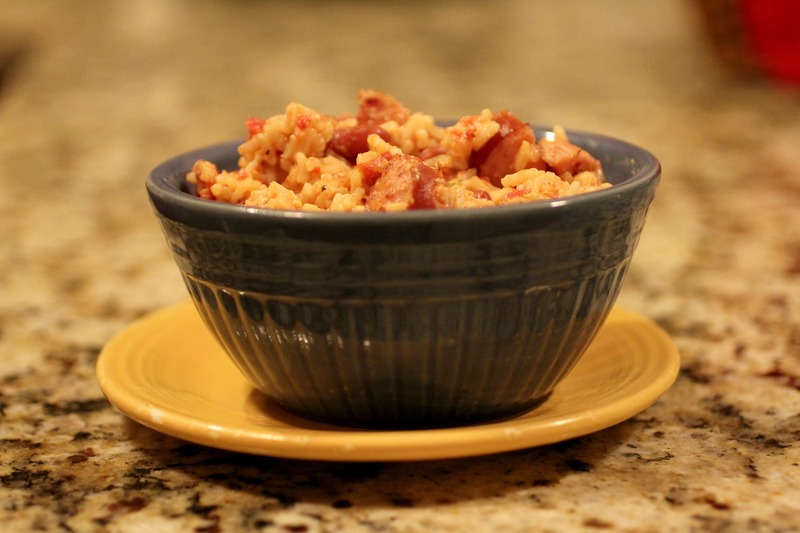 I also liked the Rotel tomatoes with chilies because it spiced up the dish a little (but not too much) and really made this version stand out from the traditional red beans and rice. *Note: I thought that this would be pretty unhealthy given all the velveeta cheese and stuff. But it turns out there’s only 320 calories per serving. Yay! 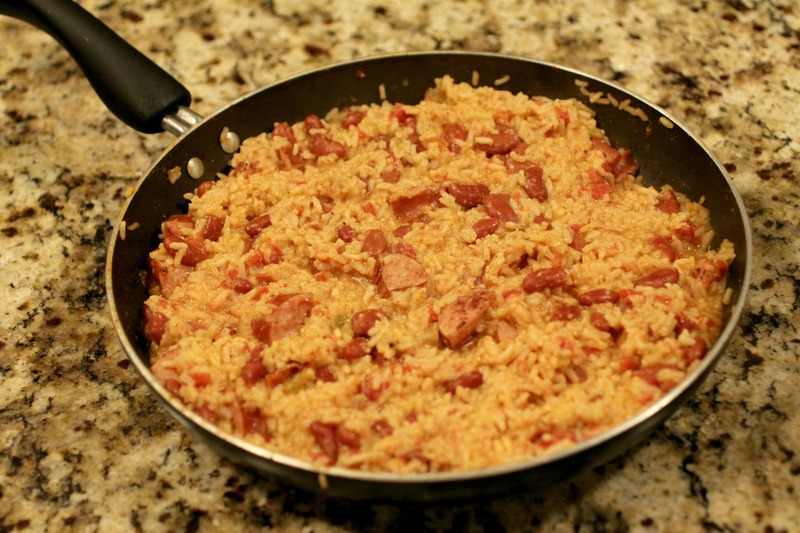 Cook sausage in large, nonstick skillet on medium-high heat 5 minutes or until lightly browned, stirring occasionally. Add beans, tomatoes and chili powder; mix well. Stir in water. Bring to boil. 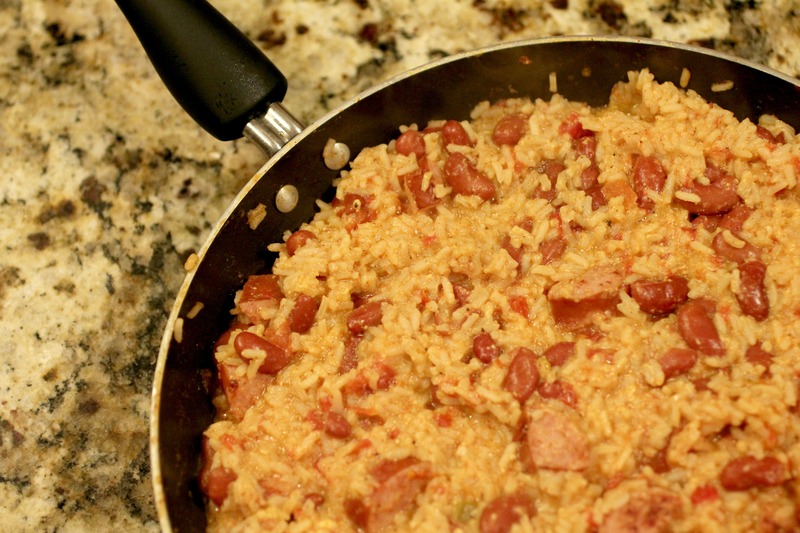 Stir in rice and Velveeta; cover. Reduce heat to low; simmer 5 to 7 minutes or until water is almost absorbed. Stir until cheese is completely melted. Um… that look amazing I don’t do velveeta because I’m trying to eat less processed foods… but I could easily do a quick cheese sauce instead!